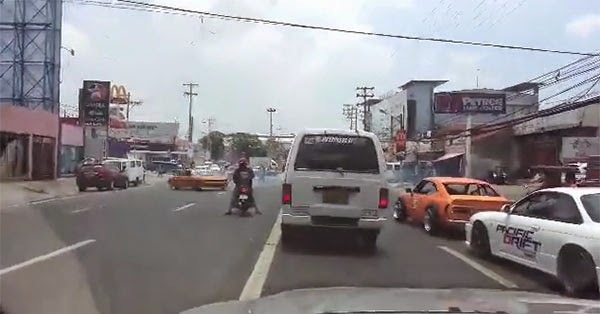 A video that captured what a netizen called "garage racers" drifting in a public road thereby causing traffic in Angeles City has gone viral. NOT ON PUBLIC ROADS, PLEASE." "A friend of mine caught these garage racers doing donuts on a public road. They literally stopped the traffic while doing these crazy maneuvers on a busy Angeles City street. This is crazy! It's unsafe and could have caused an accident." As of 6:45 p.m. today, the viral video already got more than 1,800 likes and over 200 shares. It was also viewed more than 42,800 times on the social networking site. TGP has removed the video. It turned out that the "exhibition" was part of a motorcade. We took down the video showing a car drifting on a public road in Angeles City. The organizers of Pacific Drift Championship apparently had a permit to do that.